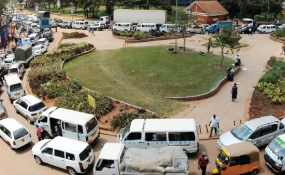 Congestion and traffic jam are a major headache for many Kampala residents but many expatriates find living in the city better than other cities in East Africa. Kampala — A woman walks alone along the street at night. The weather is great and the fruits and vegetables fresh. People discuss the latest political issue without fear, the entertainment scene is vibrant, and the sweet smell of food is everywhere. Everyone appears bold, confident, and friendly. Michael O'Hagan, a foreign journalist living in Kampala city knows what these little things mean to him. "It is the people that make Kampala a great place to live," he says, "People in Kampala are bold, friendly and confident which gives the city a great character and makes for an excellent social life." He adds: "Since I moved here two and a half years ago, I've made lots of new friends many of whom will be friends for life. I like to cook and thanks to Uganda's wonderful climate, the fresh fruit and vegetables available are among the best in the world. I really value that." But O'Hagan is also aware of a different feeling, especially from the locals. "Kampala's rolling hills make for spectacular views - especially at sunset - but sometimes I think people who have always lived here forget to appreciate how beautiful the cityscape can be," he told The Independent. It is a sentiment shared by Germany's new ambassador to Uganda, Albrecht Conze. In an interview early this year, he told The Independent that he found it "amazing" that he could sit outside on the street and have a coffee or walk through any shopping mall in Kampala freely. "May be many Ugandans don't see it that way because for you it has become normal to live in a peaceful country despite some other challenges," he said. The value of such sentiments came alive recently when Mercer, a New York based human resource consultancy firm, ranked Kampala as the best city to live in, in East Africa. Reactions were mixed and many locals were skeptical. In its 2018 report published on March 20, Mercer ranked Kampala at position 172, 14 places ahead of Nairobi (186) while Kigali was ranked the third best city to live in, in East Africa, with a global position of 190. Dar es Salaam, Tanzania's commercial city is ranked 199 out of 230 cities in the world. Interestingly, it is not only the "Mercer chaps" who find Kampala more attractive for expatriates to live in. The 2017 Ease of Settling in Index report by 'Expat Insider', a Munich-based human resource consultancy firm, ranked Uganda the eighth best country in the world for expatriates to settle in. The survey carried out in 65 countries asked participants to rate up to 43 different factors on life abroad with emphasis on personal satisfaction; both emotional (making friends abroad) and factual (personal safety). Frederick Golooba-Mutebi, a political researcher and regional analyst who has been living in both Kampala and Kigali over the last 20 years, says the Mercer report is simply "not serious" to rate Kampala ahead of cities like the Rwandan capital, Kigali. He described what he liked about Kigali: "There is no risk of waking up and finding that someone has opened up a pub or nightclub or even a church in your neighbourhood and that they are happy to keep you awake at night or interfere with your plans to lie in on a Sunday morning as they attend to their clients' needs or praise their god at the top of their voices with complete mega sound systems". Amanda Ngabirano, a lecturer of urban planning at the Department of Architecture and Physical Planning in Makerere University also sounds frustrated about Kampala. "It is incredibly difficult for people to travel, the anguish on Kampala roads and the flooding when it rains a little bit is still a challenge," she says adding that unpredictability and inefficiency pile extra costs on city residents. But a retired Ugandan journalist who has frequently travelled across the East African cities told The Independent why Kampala scores highly for him. "In this town, you can find women walking with their bags at midnight; that does not happen in other cities. I feel safer walking in Kampala. "Kampala is one city where a foreigner can say anything about this country's political issues without thinking twice. There is also some level of tolerance in terms of political dissent and public criticism. "At Entebbe Airport, foreigners will discuss how corrupt Ugandan officials are or how inefficient the system is and nothing will happen. In other countries, you cannot do that. "Those little things sell Kampala more than the cleanliness and orderliness of other cities (because) having a sense of freedom matters a lot to individuals," he concluded. Fortunately for Kampala city, it appears more people are increasingly feeling nice about it. Mercer has for three years in a row ranked it as the best city to live in East Africa. That cannot be an accident or chance. So what, according to Mercer, makes Kampala city great? Mercer analyses a city's living conditions based on 39 factors grouped in 10 categories. These include; political and social environment (political stability, crime, law enforcement); economic environment (currency exchange regulations, banking services); socio-cultural environment (media availability and censorship, limitations on personal freedom) and medical and health considerations (medical supplies and services, infectious diseases, sewage, waste disposal, air pollution). Other indicators include; schools and education (standards and availability of international schools); public services and transportation (electricity, water, public transportation, traffic congestion); recreation (restaurants, theatres, cinemas, sports and leisure); consumer goods (availability of food/daily consumption items, cars); housing (rental housing, household appliances, furniture, maintenance services) and natural environment (climate, record of natural disasters). The scores attributed to each factor are then weighted to reflect their importance to expatriates. For the general user, it offers few details on how individual cities perform on each ranking. As a business, it promises to offer such details to its clients - mainly organisations involved in paying expatriate workers. Therefore, it is not clear why Kampala is the best city according to Mercer. Possibly resulting from the lack of detail, the Mercer survey has been welcomed and derided in equal measure by many people. But Belinda Namutebi, a branding expert told The Independent on April 09 that Ugandan planners need to take rankings and endorsements from firms like Mercer seriously. In a globalized world and for marketers of the country, she said, "the product is the experience of Uganda." "This is even more so for those selling Uganda as a tourist destination," she said, "Before tourists come, they research about the destination they intend to visit. "Ugandans are not the consumers of the Uganda experience and we are not in full control of what they (tourists) hear," she said. The Mercer global city rankings has been conducted annually for the last 20 years to mainly enable multinational companies and other organisations to determine fair pay when placing expatriates on international assignments. The survey is influenced by one main determinant of any city's future in a globalised world; the ability to attract people and investments. "Decision makers increasingly acknowledge that globalisation is challenging cities to reform, innovate and compete to attract people and investments," says Slagin Parakatil, Principal at Mercer and Global Product Owner for its Quality of Living research. Parakatil notes that younger generations; millennials in particular, often have high expectations in terms of lifestyle, leisure and entertainment opportunities. So what makes Kampala a better city to live in than Nairobi, Dar, or Kigali? Vincent Mugaba would know as the Uganda Tourism Board (UTB) publicist. He told The Independent that besides the vibrant entertainment scene and food, Kampala scores highly on security and safety. Gaël Grilhot, a French independent journalist who has been filing stories for Le Monde Afrique and Radio France International for the last two years from Kampala, would agree. "Even if I know that there are some places where you don't have to walk alone, especially at night, it is the thing I like the most in Kampala," he says, "I know there are some cities in East Africa, like Nairobi and Dar es Salaam, where this is not the case." For Emmanuella Batamula, 23, a Diplomacy and International studies Master's student at Uganda Martyrs University Nkozi who has alternated living in Nairobi and Kampala all her life, thanks to the itinerant working life of her expatriate parents, Kampala's vibrancy is the main attraction. She says Kampala beats Nairobi, another vibrant city, hands down. "Although Nairobi is equally vibrant," she says, "the Kenyan capital is more expensive." Amin Tamale Kiggundu, a lecturer of urban planning at the Department of Architecture and Physical Planning in Makerere University says Mercer's rankings of the East African cities are spot on only in some aspects. "The cost of living is relatively lower in Kampala especially when it comes to availability, accessibility and affordability of a variety of food," he says. Although the Kenyan capital remains one of the biggest economies in Africa (and a key destinations in terms of foreign direct investments, especially when it comes to real estate), Kiggundu says Nairobi planners have failed to keep pace with the infrastructure needs of the residents. "Nairobi is bigger than Kampala and Kigali so infrastructure development poses a far bigger challenge for Nairobi," he says. He warns Kampala not to land in the same ditch and lists areas that need to be fixed, including decentralisation of economic activity across the city's five divisions in what he calls "mini-towns." The Kampala Capital City Authority (KCCA) appears to be working on it. In 2016, it hosted an international debate on "What Policies would make Kampala a Great 21st Century City?" Paul Collier, the renowned professor of economics and public policy and director of the International Growth Centre was the main speaker. He said making Kampala work requires massive investments in residential, commercial, and industrial structures, and infrastructure. The French journalist Grilhot agrees. He wants more sidewalks and places without pollution or traffic jam. "It is very complex and sometimes dangerous to walk alongside roads. So I am forced to take a bodaboda even for a short distance," he says. He says if Kampala wants to attract more tourists or expatriates, KCCA needs to create an interior which is quiet, green and vast park just like the Central Park in New York. Such a place already exists in Kampala, he says, "it is called the Kampala Golf Course, but it is forbidden for most residents. It only benefits a few rich people." He says transforming the Golf Course into a big park would make Kampala a less stressful city where family members can stroll about during weekends. Grilhot also says he finds it interesting that Kampala has an asset it does not use at all--Lake Victoria. It would be nice if KCCA set up lakeside walks to allow people to come to rest on weekends. Meanwhile Kampala is growing fast and needs to invest in better public services in the poorest communities - particularly roads, drainage, and electricity. "I think Kampala has more potential; there is so much Kampala can be but it is not yet there," says Batamula.